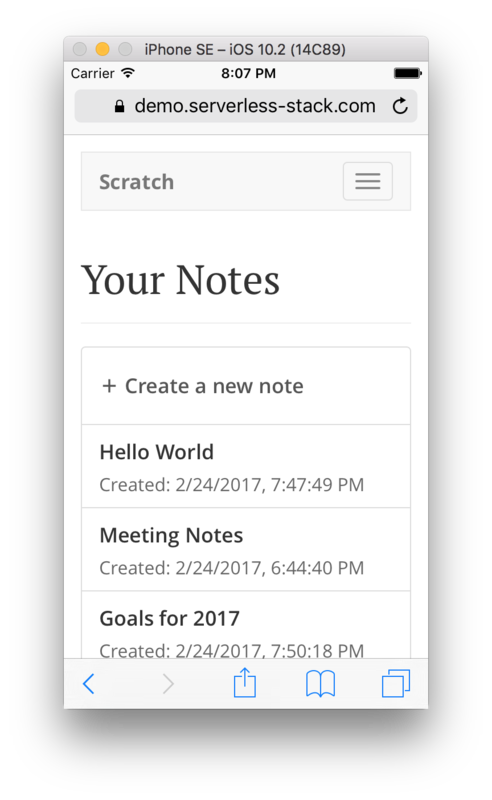 To step through the major concepts involved in building web applications, we are going to be building a simple note taking app called Scratch. We’ll be using the AWS Platform to build it. We might expand further and cover a few other platforms but we figured the AWS Platform would be a good place to start. We’ll be using the following set of technologies and services to build our serverless application. GitHub for hosting our project repos. We are going to be using the free tiers for the above services. So you should be able to sign up for them for free. This of course does not apply to purchasing a new domain to host your app. Also for AWS, you are required to put in a credit card while creating an account. So if you happen to be creating resources above and beyond what we cover in this tutorial, you might end up getting charged. While the list above might look daunting, we are trying to ensure that upon completing the guide you’ll be ready to build real-world, secure, and fully-functional web apps. And don’t worry we’ll be around to help! You need Node v8.10+ and NPM v5.5+. You also need to have basic knowledge of how to use the command line. The guide is split into two separate parts. They are both relatively standalone. The first part covers the basics while the second covers a couple of advanced topics along with a way to automate the setup. We launched this guide in early 2017 with just the first part. The Serverless Stack community has grown and many of our readers have used the setup described in this guide to build apps that power their businesses. So we decided to extend the guide and add a second part to it. This is targeting folks that are intending to use this setup for their projects. It automates all the manual steps from part 1 and helps you create a production ready workflow that you can use for all your serverless projects. Here is what we cover in the two parts. 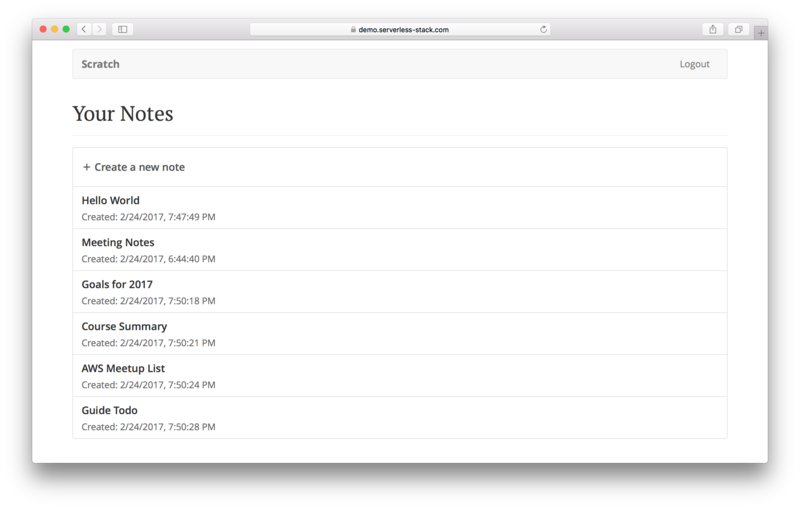 Create the notes application and deploy it. We cover all the basics. Each service is created by hand. Here is what is covered in order. Aimed at folks who are looking to use the Serverless Stack for their day-to-day projects. We automate all the steps from the first part. Here is what is covered in order. We think this will give you a good foundation on building full-stack production ready serverless applications. If there are any other concepts or technologies you’d like us to cover, feel free to let us know on our forums.